I would like to run your 'read gmail pop3'mailbox' VBscript. I have pasted it into a text file with the extension .VBS and have downloaded and installed the ActiveX (32bit) windows download. Please could you let me know what I am doing wrong - thanks. When running a VBScript, on a 64-bit Windows system it is possible to run either as a 32-bit process, or a 64-bit process. If running 32-bit, then you need the 32-bit ActiveX. If running 64-bit, then you need the 64-bit ActiveX. REM This is the 32-bit cscript. REM This is the 64-bit cscript. 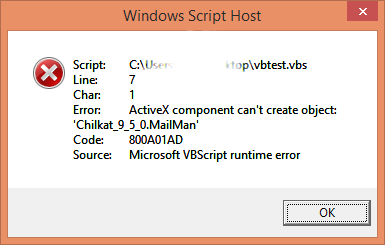 If you double-click on the .vbs to run it from Windows Explorer, then you'll be running as a 64-bit process. The default, unless you took care to explicitly run as 32-bit by invoking the cscript.exe under sysWOW64, is that you'll be running as a 64-bit process, and in that case you'll need the 64-bit Chilkat ActiveX registered on your system.